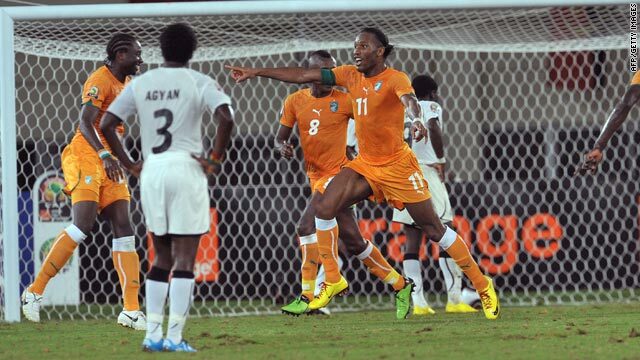 Ivory Coast captain Didier Drogba, center, celebrates after scoring his side's third goal against Ghana. (CNN) -- Pre-tournament favorites the Ivory Coast qualified for the quarterfinals of the Africa Cup of Nations with a 3-1 victory against Ghana in Angola on Friday night, despite having Emmanuel Eboue sent off. The Elephants have four points from two games, leaving Ghana and Burkina Faso to fight for the other place from Group B, with Togo having withdrawn following the deadly gun attack on their team bus. Ghana's Black Stars will need to show more penetration next Tuesday than they did on a boggy-looking, cut up pitch in Cabinda, with Burkina Faso needing just a draw to go through. Injury-hit Ghana, four-time winners of the tournament, started with captain Michael Essien on the bench as he was deemed not ready to play due to the hamstring problem that delayed his arrival from England. And while his side made it a bright start, it was the Ivorians who took the lead in the 23rd minute after a swift counter-attack, with Barcelona midfielder Yaya Toure threading a slide-rule pass behind the defense to Salomon Kalou which allowed the Chelsea striker to square a simple chance for Gervinho to knock into the net. Kalou's clubmate Essien came on at halftime for Mousse Narry and gave his team more presence in midfield, but it was the Ivory Coast who were left to rue strongarm tactics when Arsenal's Eboue was red-carded for a dreadful two-footed lunge on Agyeman Opoku in the 55th minute. Mathew Amoah almost made the Ivorians pay immediately, but his left-foot shot hit the base of the post with goalkeeper Boubacar Barry well beaten. But Ghana paid for their lack of finishing when Siaka Tiene fired in a superb free-kick in the 67th minute, with his dipping left-foot effort from the right-hand side of the pitch clearing the wall and beating keeper Richard Kingson at his near post. Kalou was stretchered off soon after following a collision with a teammate, but the Ivory Coast were comfortable and added a third goal in the final minute of regulation time when his replacement Kader Keita did well to deliver a cross which captain Didier Drogba powerfully headed home at the far post. Ghana were given a consolation penalty in time added on when halftime substitute Asamoah Gyan went down under a 50-50 challenge from Soulemane Bamba, and the Rennes striker got up to slot the goal.